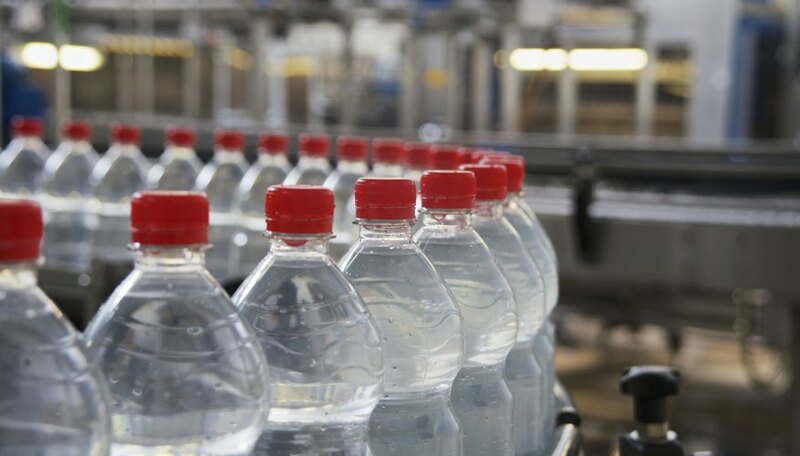 Manufacturers produce a wide array of bottles from plastic, including water bottles, soda bottles and food containers, such as those for mustard or ketchup. Polyethylene terephthalate (PET) is a particular favorite for producing any type of bottle that touches food or potable water. The material produces bottles that are lightweight, yet strong and durable. Although manufacturers may vary the process slightly based on proprietary methods, the basic method for producing bottles is universal. TL;DR: Plastic pellets are heated to 500 degrees Fahrenheit before being injected into bottle-shaped molds. PET is a plastic resin derived from petroleum hydrocarbons. The producer creates long chains of plastic molecules through a process called polymerization, and then mixes the material with several chemical compounds. They cut the resin into small pellets and send it on to the bottle manufacturer. The bottle plant mixes PET resin pellets with "regrind" -- recycled plastic that has been reduced to flakes. Plastic loses some of its physical properties when repeatedly heated, so manufacturers must limit the amount of regrind they use, typically capping this ingredient at 10% of the total mix. Unless producing clear bottles, dyes are introduced to the mix as well. An extruder melts the PET and regrind mix at temperatures of about 500 degrees Fahrenheit. A screw inside the extruder compresses the PET mix and injects the nearly molten material into molds. The mold produces a bottle preform, which is sometimes called a parison. The preform looks like a thick-walled test tube, often including the bottle’s characteristic screw top. The preform cools as it travels to a machine called a blow molder, and may need to be brought back up to the manufacturer’s specified temperature for that operation. If necessary, the bottle manufacturer raises the temperature of the preform in a small oven. The preforms enter a two-part mold that closes around it. The inside of this mold is shaped exactly like the finished bottle. Inside, a long needle pushes up through the preform, which is suspended with the screw end facing downward. The needle stretches the preform upward toward the top of the mold -- which will be the bottom of the bottle -- and simultaneously blasts enough pressurized air into the preform to force it against the sides of the mold. This stretch blow molding process must happen quickly in order to maintain the bottle’s integrity and consistent shape. Some manufacturers weld a separate bottom piece to the bottle during blow molding, while others produce a bottom from the preform along with the rest of the bottle. The bottle must be cooled almost instantly or it will lose its shape when gravity causes it to creep downward in its malleable, heated state. Some manufacturers cool the bottle by circulating cold water or liquid nitrogen through the mold, others elect to fill it with a shot of air at room temperature. The mold typically yields a clean bottle, but some flashing may occur at the bottle seams, where the two mold halves met. If so, operators trim away the excess material and add it to the regrind. Korpella, Robert. "Plastic Bottle Making Process." Sciencing, https://sciencing.com/plastic-bottle-making-process-5249914.html. 27 April 2018.